Bring your passion for wine outside to your deck or garden. An unexpected twist on the traditional half-barrel planter, this intricately carved silhouette as well as increase the growing area. 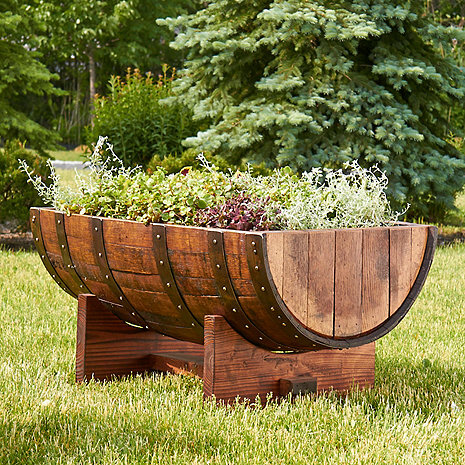 Drainage holes in the bottom allow for perfect container gardening and a base of pressure-treated wood resists damage from runoff. Solid construction means you'll enjoy it for years. Fill it with gorgeous florals, decorative foliage, or grow your own tomatoes and basil, then pair them with your favorite Sauvignon Blanc. This item ships directly from the manufacturer via Door-to-Door Delivery. Please allow 2-3 weeks for delivery. Select items will have additional shipping charges, please see above for this item's additional shipping charge. What is thickness of wood and actual barely depth? I was hoping for a high end piece in my home. The ends of the barrel were replaced with something that looks like synthetic wood decking. Kind of spoils the effect. I have it tucked in a corner in an effort to hide the ends. I wouldn't recommend buying this piece.